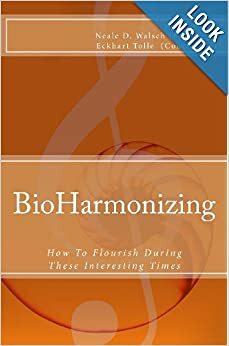 Thanks for making BioHarmonizing a best-selling book, for the third time! Readers, who want to identify and implement meaningful New Year’s Resolutions, can now count on one powerful set of inspirations: the book ”BioHarmonizing: How To Flourish During Our Interesting Times”. It brings the wisdom of Neale Donald Walsch, as foreword. The presence of Eckhart Tolle, in the conclusion. In between eight chapters, written by Dharma instructor Frank Ra, make easier to let it go of conditioning, live life at one’s full potential, and be beyond narratives. The book is a companion on humanity’s journey, from perceived fragmentation through wholeness. To readers asking for suggestion about their New Year’s Resolutions, Frank tells that “2014 is about living joyfully for the benefit of all beings. You can take one measurable resolution, which facilitates your own well-being in a tangible way. For example, meditating, eating healthy food, or exercising regularly. And you can add a resolution which matters to you, but goes well beyond yourself. You can volunteer in your local community, support mindful entertainment (like Milton’s Secret movie), help to keep your neighborhood safe and clean, etc.”. He adds: “New Year’s Resolutions that you take for your own benefit should be clearly measurable, and have clear benefits and outcomes in mind. Resolutions you take for your community, and society as a whole, should be allocated measurable resources (example: two hours per week) and be mindful of the benefits they can bring to all beings. And they are also to be enjoyed in themselves, without expectations about how you will benefit personally. In both cases, make sure to share your resolutions with family and friend. You may find they want to join you on your joyful journey, plus committing publicly to a resolution makes more likely for you to deliver it”. After this New Year’s Resolutions Video went viral, and “BioHarmonizing” became part of a special “Kindle Countdown” promotion, Frank’s book started to climb in sales rank and became, for the third time, an Amazon best-seller. NEW YEAR’S RESOLUTIONS 2014: http://www.BioHarmonizing.com offers you inspirations and tools to make meaningful new year’s resolutions. This is the syllabus for our Personal Development eCourse: A course in happiness. You can join the eCourse (instant access), and receive for free all the study material (instant download as eBook). Our “Personal Development eCourse: A course in happiness” provides you strategies and tools to live happier, now and here. Happiness is more about attitudes and choices, than external factors. After exploring the AmAre framework, we learn more about research – both in natural and social sciences – in the field of well-being, and how to apply it to daily life. Personal Development eCourse: A course in happiness is about cultivating happiness, together, to live happier lives, to benefit all. 3.How do you apply the course material to live happier, now and here? Thanks to everyone who is taking this course! Your interaction with fellow students and with the facilitator/lecturers is what really makes a difference in the learning, and especially real-life application, process! Thanks to everyone who is helping in creating awareness about this course! Your help is making a difference in reaching people who want to join us! Thank you so much to Stephen and Watkins Books for the interview given earlier on this week! Watkins is a unique bookshop specializing in mind body spirit, modern teachers and magic. Established in 1893, it may well be the oldest esoteric bookshop in the UK, if not the world. Watkins has been trading in the same premises in Cecil Court since 1901. The nearest tube station is Leicester Square. Join us for a special evening to meet Eckhart Tolle’s movie director Barnet Bain (What Dreams May Come, The Celestine Prophecy) and producers, Ryan and Stephen, at their studio in Vancouver, where Eckhart was interviewed about the movie (his videos are on http://www.msthemovie.com). 1) if you are in Vancouver, you can register for free on http://www.meetup.com/EckhartTolleVancouver/events/143774552/ to attend in person. 4) If you live in a different time zone, or if the streaming has any technical issues and you cannot see us, we should be able to record the event and make it available to remote participants who contacted me by email. – Milton’s Secret campaign on IndieGoGo- Chat with Stephen and Ryan, the Canadian producers of “Milton’s Secret”, who will share about their meetings with Eckhart, their paths, etc. and answer questions from participants. MILTON’S SECRET carries a very timely message about bullying. It is a coming of age story about an 11-year-old boy growing up in an economically depressed suburb, and the elder quest of his grandfather. His mother and father are workaholics with marital and financial problems, and he is being bullied at school. When his grandfather visits, Milton learns that rehashing the past and worrying about the future are preventing him from finding true happiness in the Now. Please visit http://www.msthemovie.com now to see how you can be part of this. Thanks!